Corn is the third largest crop in the world and a massive part of the American economy. Furthermore, it's almost everywhere we look. Of course we eat it, but it's used in a lot of ways that we could use hemp for, building, textiles, etc. Driving across the states of Illinois and Iowa as a child I remember watching the, seemingly endless, mechanically uniform rows of corn whizzing by. One thousand times a second (or so it seemed) you could catch a glimpse into a corridor of maize. It felt like peering into eternity! Corn was a summer time staple, the candy sweet kernels dressed lightly with butter and salt. It does something mystical to me; the smell of fireworks, the sound of a pop can on my bicycle tire, and the feeling of a summer day transitioning into an impromptu bon fire have more to do with corn than any food I've ever eaten. To me, corn represents the freedom of my childhood. 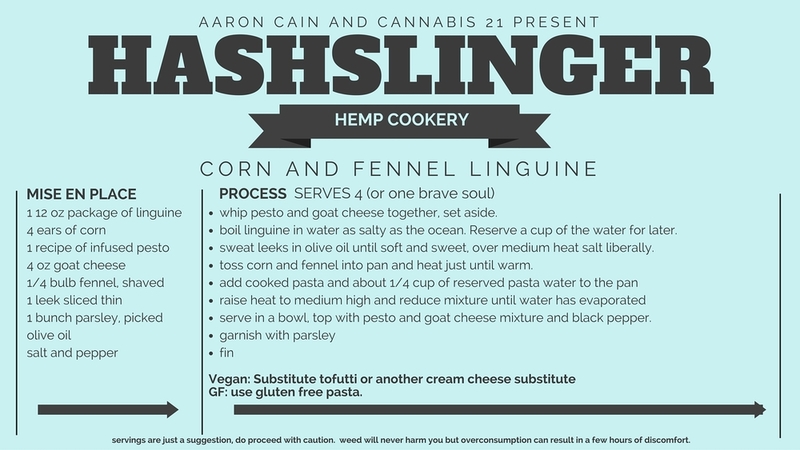 The Hashslinger Hemp Cookery decided that it was time for corn to grow up with us and create brand new summer memories for years to come.